Have Saudis Overstated How Much Oil Is Left? 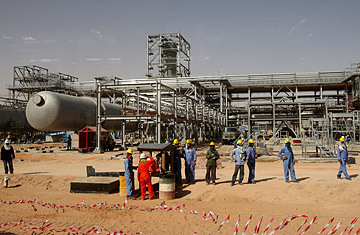 Workers look at journalists during a media tour of the Khurais oilfield, about 160 km (99 miles) from Riyadh in 2008. While the world remains transfixed by the Egyptian revolt, a crisis with equally profound global consequences is quietly brewing elsewhere in the Middle East: WikiLeaks this week released U.S. diplomatic cables suggesting that Saudi Arabia may have vastly overstated its oil reserves  if true, that could dramatically accelerate the arrival of the long-feared "peak oil" moment, when oil production hits its final high before slowly declining, keeping prices rising for the foreseeable future and slowing global economic growth. But not all industry analysts are convinced by the claims in the cables. The diplomatic cables from the U.S. embassy in Riyadh between 2007 and 2009 cite a former senior executive of Saudi Arabia's state-run Aramco oil company as revealing to American officials that the country's official estimate of 716 billion barrels of oil reserves is, well, hogwash; the real figure is about 40% lower than that, according to the oil executive, Sadad al-Husseini, a geologist who until 2004 headed Aramco's exploration department  a seemingly impeccable source. WikiLeaks released the four cables on Tuesday. As a private citizen no longer representing the company, Husseini was apparently free to speak candidly. And in a November 2007 meeting with the U.S. economic officer in Riyadh, he broke the sobering news that the country's reserves were nowhere near as big as officials were claiming. "First, it is possible that Saudi reserves are not as bountiful as sometimes described," the U.S. Consul General John Kincannon in Riyadh wrote to State Department officials in Washington, reporting on Husseini's analysis, "and the timeline for their production not as unrestrained as Aramco and energy optimists would like to portray." Consider the implications: For years the Opec cartel of oil producing countries  of which Saudi Arabia is by far the most powerful member  as well as Western officials and oil traders have insisted that world will have enough oil for the foreseeable future. That's because Saudi Arabia was believed to be able to pump as much as 12.5 million barrels a day  and that it has "spare capacity" (a term frequently used by oil analysts) to pump on to the market quickly to fill any shortfall of supply from elsewhere caused by war, natural disasters or other unforeseen events. The Kingdom currently produces about 8 million barrels a day, ostensibly leaving it plenty more to release on to world markets at short notice. The belief that Saudi Arabia is the one country with significant reserves at the ready has given it immense clout in the global oil industry, and the status of a vital partner of the world's biggest consumer, the United States. Oil analysts hang on every word spoken by Saudi Oil Minister Ali al-Naimi. Last November, Naimi told journalists that he now considered the "fair price" for oil on world markets to be between $70 and $90 a barrel-an increase of $10 a barrel from his previous upper estimates; with hundreds of thousands of protesters storming the citadel of the Arab world's most populous country, Egypt, oil futures have shot above $100 a barrel this month. But what if Saudi Arabia cannot pump enough oil to keep the world's oil supplies flowing smoothly and prices stable? Reading the WikiLeaks cables, that possibility seems real enough. Geologist Husseini told U.S. officials in Riyadh that world oil supplies could hit a peak "within five to 10 years" in other words, by 2012  "and will last some 15 years, until world oil production begins to decline," according to the 2007 Kincannon cable. If so, by next year the world could be producing as much oil as it will ever be able to do. Not everyone is convinced by Husseini, however. Manouchehr Takin, a senior analyst at the Center for Global Energy Studies in London and a former senior official in Opec, believes that the WikiLeaks cables are alarmist, and that geologists have made vast improvements in oil technology, that greatly change oil production calculations. "What the previous generation of geologists could not dream of doing is now being done by the current generation," Takin says. "We are drilling to more than 30,000 feet now." Takin says he believes Husseini's estimate of Saudi Arabia's true reserves  the amount it can realistically produce  is based on a much less optimistic outlook about oil technology; Takin is sure Saudi Arabia's stated oil reserves are accurate. But deciphering the Saudi oil reserves, and Husseini's estimates, is about as tricky as predicting when exactly the world will run out of oil  which, says Takin, "is a finite resources which will one day run out." Firstly, Husseini retired in 2004 after being passed over for Aramco's top job as chief executive, leading some experts to wonder whether he might hold a grudge against his former employers. Secondly, Saudi Arabia, like other Opec members, is thought to have long fudged its figures about how much oil they can practically bring to the surface. Indeed, oil experts say it is impossible to be certain how big any country's oil reserves are, since those statistics are based on what countries report, and in many countries, those figures are tightly held secrets. "The fact of the matter is we simply do not know," says Paul Stevens, senior research fellow for energy at the think tank Chatham House in London. "That is true of the reserves of most of the Opec countries." Stevens points out that in 1987, when Opec members were negotiating among themselves what production quota each country should have, about five countries with small populations  including Saudi Arabia  dramatically changed the figures of their oil reserves. "The way you do that is you creep along to the chief geologist's office and say, 'change the recoverable factor,' " says Stevens. "It led to a certain degree of skepticism." And this week, WikiLeaks deepened those doubts.